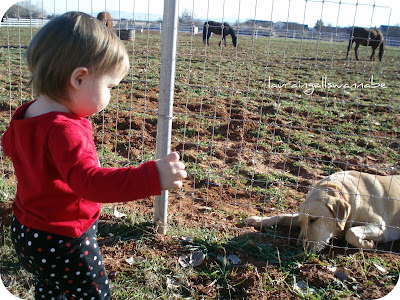 the journals of a Laura Ingalls wannabe: Wordless Wednesday: Margaret's New "Baby"
A large, friendly dog spends most of her days playing with the horses in the pasture behind our house. Whenever Margaret sees her, she says "Awww!" and signs "baby."